BlackBerry today scrapped its company name of Research in Motion as it launched its long-awaited mobile operating system (OS), BlackBerry 10. “We have definitely been on a journey of transformation, both business and brand [moving] into true mobile computing,” he said. “The future is still going to be hard work, bringing a new platform to market and ushering it through. We knew it was risky and took some brutal honesty [in the company], but we have transformed ourselves inside and out. From today, we are BlackBerry everywhere in the world." As Research in Motion, the Canadian company has seen profits fall in recent times as competitors like Apple and Samsung won over its customers. In the third quarter of 2012, which ended on 1 December, net profit was just $9m, down from $235m in the previous quarter and $265m from 12 months ago. Now BlackBerry is hoping with its new brand, new mobile OS and two new handsets, it can build itself back up. “More now than ever, we are a company united in its vision for mobile computing and it all starts today with our rebranding and launch of BlackBerry10,” said Heins, along with the new company slogan of "Re-designed, re-engineered, re-invented." BlackBerry 10 itself is a brand new platform from the firm. It focuses around the BlackBerry Hub, where users can access all of their messages, emails, social network communications and their calendar without having to enter separate apps. The BlackBerry flow feature links contacts to all of their online profiles, removing the need for searching and giving a full view of a person with one button. New gesture technology aims to allow typing with just one thumb and multi-language support recognises the language you are typing in. It will launch with 70,000 applications, including Skype, WhatsApp, SAP and Amazon Kindle, along with high-profile games like Angry Birds. The mobile OS will run on two new handsets from BlackBerry, one with the traditional and familiar physical keyboard named the Q10 and one fully touchscreen – the first time BlackBerry has released such a handset – named the Z10. 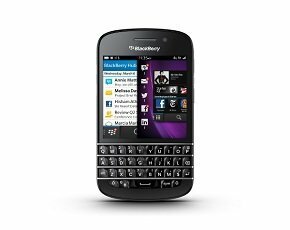 While the Q10 won’t hit the shelves until April, the Z10 will launch in the UK before any other territory on 31 January, 2012. All of the major operators, as well as BT, will be selling the device which is 4G-enabled, ready for the speedier connectivity as it rolls out across the country. The BlackBerry Z10 is at the high-end of the market, however. The cheapest offer from Vodafone will see an upfront payment of £69 and a monthly payment of £37 for two years, giving you unlimited texts, phone calls and 1GB of data, whereas O2 is promising the handset for free on a £36 per month contract over two years. We have got our hands on a Z10 so will bring you a full review shortly.